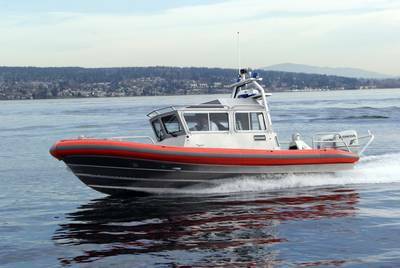 Kvichak Marine Industries deliver the 'Patrol 28', a 28’x 9’3” all-aluminum vessel to the Boston Police Department Harbor Unit (BPD). Designed by Kvichak/Amgram Ltd., UK and built by Kvichak Marine, the Patrol 28 is effective for operation in port and coastal waters, including shallow areas. Missions for the Patrol 28 include search and rescue, border patrol and maritime security. Powered by twin Honda 225 hp VTEC outboards, the Patrol 28 cruises at speeds over 45 knots.